Most commonly considered a grain, quinoa is actually a relative of leafy green vegetables like spinach and Swiss chard and beets. Quinoa is an ancient grain that originated in the South American Andes. It was once a staple for the Aztecs and it has recently been reintroduced into our kitchens. Cooked quinoa seeds are fluffy and creamy, yet slightly crunchy and have a delicate, somewhat nutty flavour. While the most popular type of quinoa is a yellow colour, other varieties feature colours such as orange, pink, red, purple or black. Quinoa is a very good source of manganese. It is also a good source of magnesium, iron, copper and phosphorus. These minerals are important for overall good health and for the healthy bones and strong immune system. Quinoa is very low in gluten and can be use by certain individuals with a gluten intolerance. Quinoa is rich in protein and contains all eight essential amino acids. 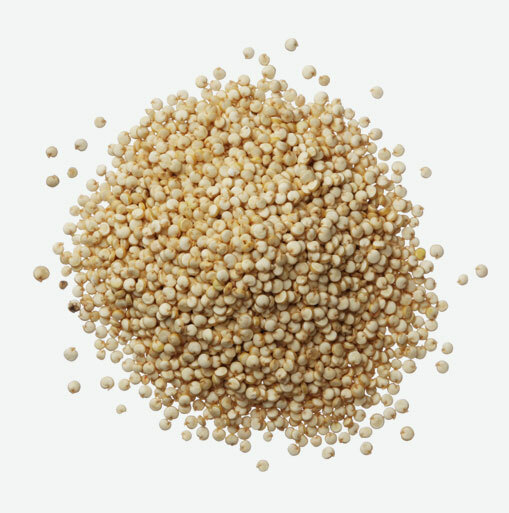 Quinoa is available as a whole grain, flakes, flour, and as a pasta blended with rice flour. Quinoa is generally available in prepackaged containers as well as bulk bins. Just as with any other food that you may purchase in the bulk section, make sure that the bins containing the quinoa are covered and that the store has a good product turnover to ensure maximum freshness. Whether purchasing quinoa in bulk or in a packaged container, make sure that there is no evidence of moisture. When deciding upon the amount to purchase, remember that quinoa expands during the cooking process to several times its original size. Store quinoa in an airtight container. It will keep for a longer period of time, approximately three to six months, if stored in the refrigerator. To ensure that the saponins and residue have been completely removed, rinse the quinoa well and let soak in cold water about 3 to 4 minutes. Rinse with cold water again for a couple of times. To cook the quinoa, add one part of the grain to two parts liquid in a saucepan. After the mixture is brought to a boil, reduce the heat to simmer and cover. One cup of quinoa cooked in this method usually takes 15 minutes to prepare. When cooking is complete, you will notice that the grains have become translucent, and the white germ has partially detached itself, appearing like a white-spiraled tail. Combine cooked chilled quinoa with pinto beans, pumpkin seeds, green onions and coriander. Season to taste and enjoy this south-of-the-border inspired salad. Quinoa is great to use in tabouleh, serving as a delicious (and wheat-free) substitute for the bulgur wheat with which this Middle Eastern dish is usually made.